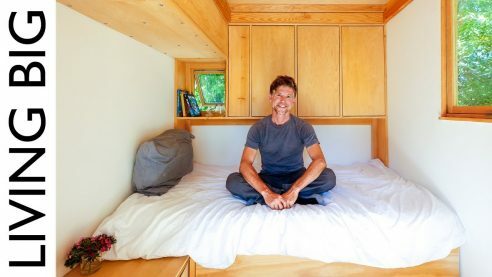 Just sent to us by French carpenter Yogan, who has been featured in both Tiny Homes and Tiny Homes on the Move. 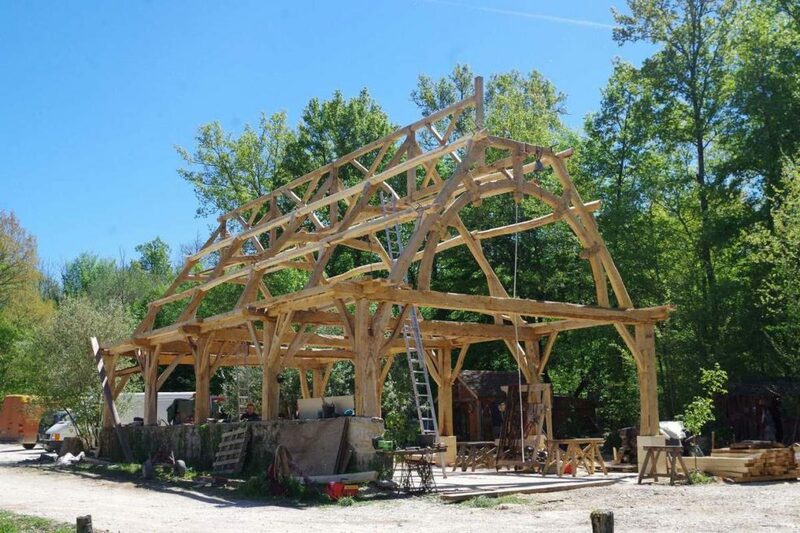 We’re a small committee of independent carpenters based in the Dordogne region in SW France. 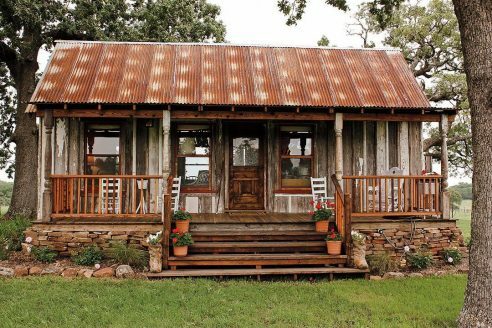 Apart from being cabin-ophiles, we aim to pass on traditional building techniques to a new generation of builders and folks looking to construct their lifeworlds in a more organic fashion. 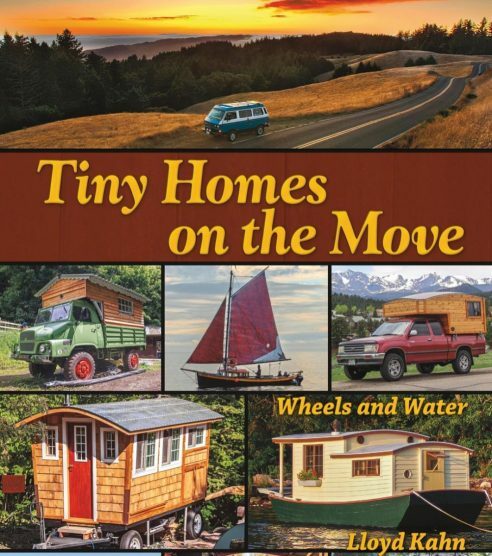 Our habitats span from treehouses to underground hobbit caves, to converted horsecarts, to tree ships (some of which feature in Lloyd Kahn’s 2011 Tiny Homes: Simple Shelter and the new 2014 Tiny Homes on the Move). 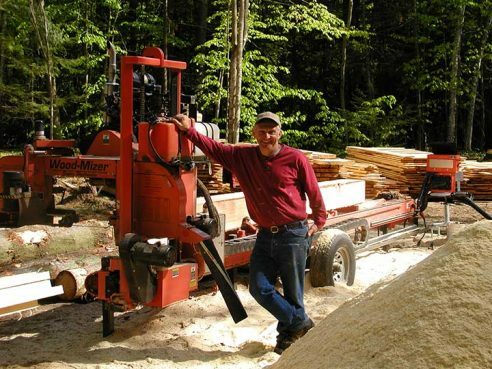 Originally travelling carpenters, an increasing desire to settle down and create a more stable workbase has seen us conceive a carpentry workshop project. Such a base also enables us to organise workshops to share our experiences with motivated people — rare are the builders that nowadays still master intriguing wood assemblages with tenons and mortise! We launched the project this winter by cutting roughly 50 oak and chestnut trees in our adjacent forest. The longest (5 pieces of 9 meters) and the most warped ones we squared off with adzes and axes, and the remaining ones we worked with the help of a small mobile sawmill manned with old pensionners from the village. March and April saw a very colourful international blend of carpenters, joiners, sculpturers, stonemasons, cooks and a myriad of other types of helpers unite to create the 9m high framework of the workshop — every piece is unique and was assembled meticulously on the floor before we hissed it all together within the final two days, tired but satisfied. A temporary tarp over the framework is protecting us, our machines and our pieces of work from the unreliable weather. The tarp is tattered and broken in many parts already, and the storms over the last couple of weeks have contributed to making this situation rather unsustainable. We seek to cover the roof asap with ancient flat handmade clay tiles (0.45 euro/piece), but don’t have the financial means to do so. Evidently we could finish with cheaper material but this would go against our convictions — and would simply kill the style. We thus launch an appeal to the international community of likeminded people: Help us materialise our dreams and unite tradition with futuristic ecological construction — and thereby inspire and pave the way for ideas to germ and grow roots in the heads of people that will come across this space of creation. It’s all about give and take, so in return for your support you can choose from a whole list of tokens of appreciation : from residing in a cabin of your choice on site (plane ticket not included) to bottles of our estate wine/jars of homemade jam/box of homemade eggs (all of the above to be picked up on site). Ok, we realise the above is not very intriguing for our overseas supporters, so we promise we’ll come up with an easily sendable token, i.e. Homemade wooden spoon, forged knife, spinning-top made on bike-powered wood lathe, wooden sculptures etc. — just specify in the commentary section on the kisskissbankbank site that you are in a faraway land.